Why use a ‘Bullet’ type Insert? Flow inserts can be used for many different reasons, such as improving flow, reducing overpressures on feeders, rectifying segregation and inhibiting ‘Flushing’. They are often installed as retrofits to overcome operating problems, but require experienced design to secure optimum benefits without introducing other problems. 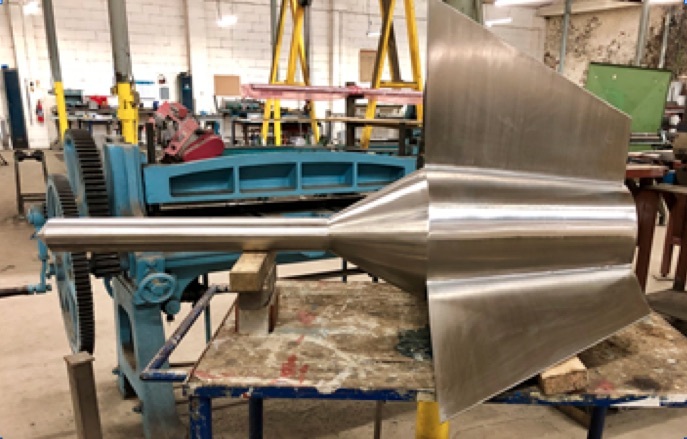 The ‘Cone-in-Cone’ and ‘Bullet’ Types are amongst methods used to improve flow by converting a flow regime from Funnel to Mass flow so, the question is which type is most appropriate for the application? The key feature of the ‘Bullet’ type insert is that it has a wall angle based on the difference between the angles of the conical hopper wall and that of the insert relative to the vertical being less than the critical mass flow angle. This may be compared with the Cone-in-Cone insert, where the inclination of the Cone-in-Cone wall from the vertical is half that of the basic cone angle. In the case of the commonly used cone with wall angle of 60° to the horizontal, the cone-in-Cone annulus equates to a cone wall inclination of 15° to the vertical, whereas the required angle for mass flow may be less or more than this, either of which can be generated by a correctly designed ‘Bullet’ type insert. Clearly, the ‘Bullet’ type insert can be employed in applications where a Cone-in-Cone’ type would not convert the flow regime from Funnel to Mass Flow. It is noted that the basic principle of both forms of insert an be applied to ‘V’ shaped hoppers. However, a further limitation of a ‘V in V’ type insert is that it is awkward to reinforce the insert walls to contain flow pressures without compromising flow, whereas a modified ‘Bullet’ type can be stiffened by internal ribs. All times are GMT +1. The time now is 9:11.